A backing up truck nearly clipped a skateboarder, in one of more than 1,200 videos prepared by activists trying to shut down Brooklyn Transfer LLC. EAST WILLIAMSBURG — A Brooklyn waste transfer facility is flouting health and safety regulations with impunity, to the detriment of its residential neighbors who've been forced to police it themselves, according to new report released by North Brooklyn activists. During a six-day period in May, trash reformers tallied 1,262 health, safety and traffic violations from one private waste transfer facility, Brooklyn Transfer LLC, located at 115 Thames St. and run by Five Star Carting, according to a report released Wednesday night. Brooklyn Transfer is one of roughly 20 private waste transfer facilities in the North Brooklyn industrial zone that are hired to cart garbage from restaurants, offices and other commercial businesses. Though the company was issued no violations by the city during that time, activists point to more than 1,000 videos from surveillance cameras from the surrounding streets that capture trucks idling, open doors at the facility, trucks backing up without guidance, waste being sprayed into city sewers instead of inside, and trucks running through stop signs, among other concerns. The city should force the company, which took over the operation there in 2010, to shut down the facility, the report concludes. The facility itself has been there for decades. "These are violations occurring in plain sight," said Ben Weinstein, of Clean Up North Brooklyn, a group that has been pressing to shut down Brooklyn Transfer for more than a year. "[The report is meant] to demonstrate there's really no enforcement by city agencies." 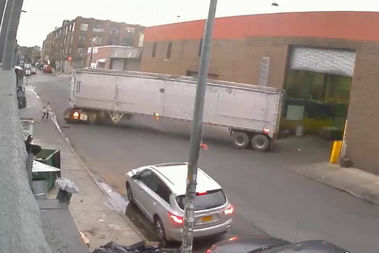 Advocates with Clean Up North Brooklyn collected videos from security cameras all around the facility showing that between May 23 and May 28, there were 63 instances of idling trucks, 267 times the facility's door was left open, 118 times a truck drove on a sidewalk, 91 times trucks blew through nearby stop signs, 250 cases of trucks off-route, and 22 instances when trucks went the wrong way on a one-way street, among a slew of other concerns. "It's unfortunate that we have to stand vigilant for six days non-stop in order to prove the horrors on this block," said City Councilman Antonio Reynoso, chairman of the Sanitation Committee who's also been pushing for a shutdown of the facility. "When you're a neighbor, you should be a good one. We're not going to accept you being a C player or a D player across the street from families and young children," he said. "They have an inability to be an A player, and that means that they have to go." The extensive video evidence captured many regular occurrences on the block, neighbors say, and some strange and troublesome ones, like when a worker from Brooklyn Transfer hacks down a Department of Transportation parking sign and stashes it inside. Or when a passing skateboarder dives off her board as a truck with no attendant nearly struck her. "This report raises important community concerns about the operation of this facility, and we are carefully reviewing the report to determine what, if any, action is necessary at this time," Department of Sanitation spokeswoman Belinda Mager said. This year, the department had conducted "nearly 60 full inspections" and 70 "drive-by" inspections, Mager said, but no DSNY citations were issued. The company was cited twice last year and had to pay $7,500 in fines for foul odors and leaving the building door open too long. Mager encouraged neighbors to call 311 if they see violations. Lupe Todd-Medina, a spokeswoman for Five Star Carting, called the report "factually inaccurate" because she couldn't authenticate any of the videos and that they were "bias in scope." She called the private carting business "a dirty business that has to get done." "Trash and garbage must be removed from our city streets and with no landfill, the burden is put upon companies like the ones being targeted in this report," she said. "It is wrong for people to call into question a company that employs hundreds of workers from the community where Brooklyn Transfer has resided for over 40 years, unlike some of the new café’s, boutique stores and artists in the neighborhood."